Over her long career, designer Mary Norton has won critical acclaim and loyal fans for her magnificent, whimsical accessories. In 1998, after finding inspiration from a dream, Mary designed her first handbag. Mary's designs have been a staple of red carpet celebrities such as Beyoncé, Sharon Stone, Kim Kardashian. Her brands have been featured in Vogue, Elle, InStyle, The New York Times, Vanity Fair and many others. Mary herself has been featured on The Today Show, E! Red Carpet Oscars Report, and Extra just to name a few. Since the close of Mary Norton Inc. in 2009, Mary has been successfully reinventing herself and reviving her brand. Mary now is able to assist people to re-imagine and repurpose themselves. By unveiling their true spiritual essence, she helps them to realign with their soul purpose. Mary teaches her clients how to tap into their own unique spiritual essences and guides them into reunion with "The Source", changing lives, businesses, love lives, and creativity - truly everything. The ReCreation series launches at Seeking Indigo Thursday, June 13th at 7pm. Sign up with Cyndi if you are interested in attending a cocktail meet and greet with like minded folks before the program at 6pm. This is a free event, but please RSVP with Cyndi by email: info@seekingindigo.com or by calling 843-725-0217. We are so pleased to add another regional designer to our offering at Seeking Indigo. Anne Belen's creations are all one of a kind and designed with a specific person in mind. All of her pieces are made of high-quality silver, gold fill and semi-presious gemstones. 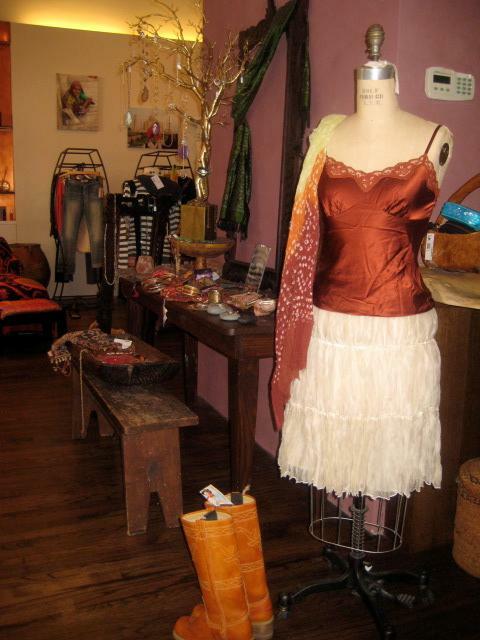 Stop in this weekend to see her newest collection featured at Seeking Indigo! If you missed meeting Anne at the desginer showcase in April, no worries, we'll be hosting another Regional Designer Showcase on Thursday, June 2 where you can meet all 20 of our local artists for an evening of fun, fashion and wellness! Fashion from the inside out. It's that exciting time of the year for Charleston! Fashion Week has arrived and the hustle and bustle starts Tonight under the tents in Marion Square. This year, we are busy working on an exclusive new Seeking Indigo collection that will launch just in time for Fashion Week next year. We tried to speed up the schedule but working with authentic artisans across the globe takes time. Want to get the Seeking Indigo look now... stop in to find that Boho Retro Chic look with a spiritual twist...... yoga inspired jewelry, vintage cowboy boots, Buddha necklaces, and that short little sassy dress for spring that will make you Feel as good as you Look! Feeling good is what sets Seeking Indigo apart and we know that when you work on the inside the outside comes effortlessly. We've been traveling the globe to put our little spin on worldy fashion that is often described as an Anthropologie for the soul! Seeking a lifestyle look all of your own? Stop into Seeking Indigo today!